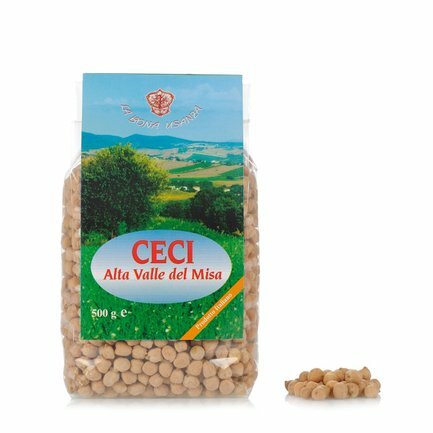 In the beautiful area of the central Marche, in particular in the Upper Misa Valley, the La Bona Usanza cooperative has restarted growing the typical legumes of the area, whose use has been lost over time. Of these, a variety that plays a particular role is the chickpea, small, flavourful, tender, grown according to the most important principles of environmental sustainability. 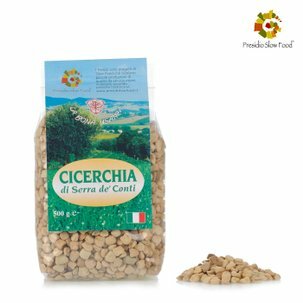 Chickpeas are perfect in soups, minestrones, and also delicious alone or with a bit of salt, a small amount of oil and chives. This legume must be soaked before cooking. Ingredients CHICK PEAS. ALLERGENS: LUPIN < D.L. GLUTEN < D.L. (D.L.= DETECTION LIMIT) For more information on product labels, please contact our Customer Service department. The information on the labels of the products may vary for reasons beyond our control, therefore, there may be discrepancies between the information on the site and that on the products delivered. Please always check the information on the product before consumption or use.